Just recently I acquired a new addiction... yes it was a Lush product. I have avoided going into a Lush shops as every time I step in I'd find myself overwhelmed by fragrance and so many colours and products that are not necessarily what you might first think. Also, price wise I would put them in the not-cheep, but more of the ''I deserve a treat'' category. As I have been stressed out recently a friend of mine suggested a nice bubble bath and a LUSH bomb. And it worked. So, I was back in the shop again and this time I bought Rub Rub Rub, Shower scrub. Soon as I got back from work I just had to try it out. 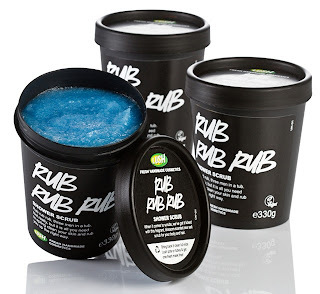 The consistency of Rub Rub Rub is more of a runny gel like scrub. Salt particles are very fine and even looking therefore they leave body gently exfoliated. I like to apply mine in the shower (make sure the tub is away from the direct water flow otherwise you'll end up wasting the product), stepping away from direct flow I apply a nice scoop all over. I even shampooed my hair with it and I was so surprised that it lathered as much as it did. And then I just stepped back and washed it all off :) My hair did need a bit of conditioning afterwards but the skin was so soft. I really like the smell of Rub Rub Rub (if you like the smell of sea and freshness this one is for you). This product is packed with mineral rich sea salt and organic lemon juice. Jasmin, mimosa and orange flower leave a lingering subtle scent. Just lovely.